The exhibition ‘The Margins of the Factory’ presented two recent projects by the Rotterdam-based duo Iratxe Jaio & Klaas van Gorkum motivated by their interest in art’s relationship with labour. Each explored sculptural form and manufacturing processes from the perspective of artists who have not usually made objects. Jaio & van Gorkum undertake what are in part sociological investigations by documenting the local, marginal effects of the displacement of manufacturing industries over the last two generations with the emergence of the global market. Emerging from the artists’ personal history and implicating the direct effects of their own vocation as well as work they ask of others, the projects are moreover complicit in asking what kind of industriousness brings value and what political life objects might have. The exhibition opening featured a performance by British “avant-folk” musician Nathaniel Robin Mann, developed in collaboration with Jaio & van Gorkum around the raw footage of ‘Work in Progress’ and the tradition of work song. Mann interpreted the Basque popular song “Oi Peio Peio” – a dialogue between a woman worker and her cruel boss, who insists that she carries on working throughout the night. First collected in Cancionero Popular Vasco in 1918, the song was popularized by singer–songwriter Mikel Laboa, founder of “Ez Dok Amairu” (“No Thirteen”), the cultural movement of Basque poets, musicians and artists whose name was a suggestion of sculptor Jorge Oteiza. Watch video. 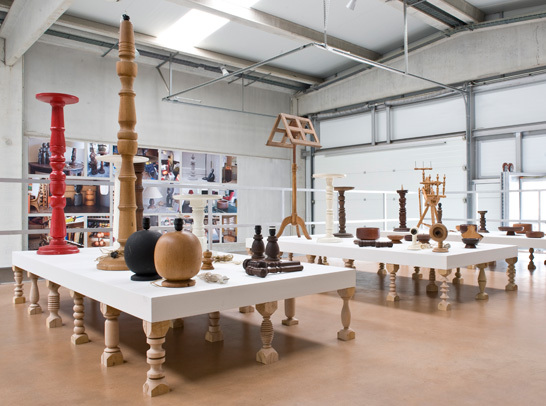 Central to the work ‘Producing time in between other things’ (2011) is a selection of wooden objects made by retired factory worker Jos van Gorkum – Gorkum’s grandfather – which the artists documented in the homes of his relations, friends and former neighbours across the Netherlands. During this process, the artists located the original lathe on which these items had been crafted and began to teach themselves woodturning. 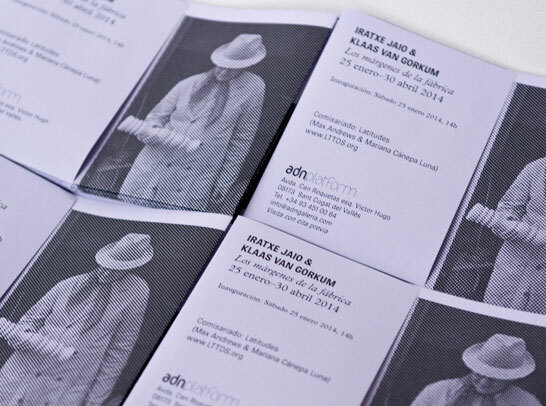 The forms which they made as they worked at learning a hobby become the means to support the display of the original objects, presented alongside three videos and photography. ‘Work in Progress’ (2013) immerses itself in the manufacturing industry of Markina-Xemein, the rural Basque village where Jaio comes from. A video documents the mass-production of rubber car parts, following the pieces from the assembly line in a worker-owned factory to subcontracted workshops where informal workers finish them by hand. Several of these workers are employed by the artists to cast hundreds of replicas of small modernist sculptures. 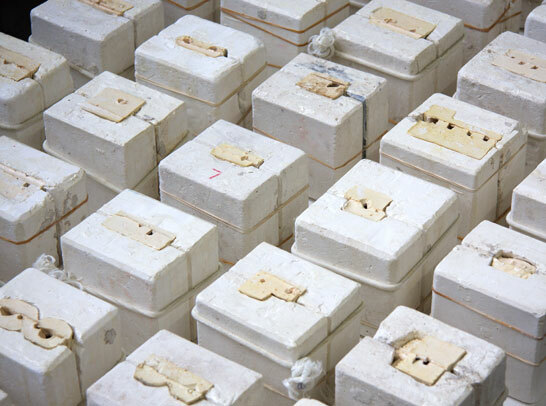 These are displayed on mass-produced shelving to evoke the “Chalk Laboratory” of Basque sculptor Jorge Oteiza, a fierce critic of the commodification of art. 14.15h: Voice and instrumental performance by Nathaniel Robin Mann, as part of 'The Margins of the Factory'. Iratxe Jaio (1976, Markina-Xemein, Spain) & Klaas van Gorkum (1975, Delft, the Netherlands) live in Rotterdam, the Netherlands, and have been working together since 2001. They both studied Fine Arts at the Royal Academy of Fine Arts, The Hague. Their solo projects include: 'Réinventer le monde (autour de l'usine)', FRAC Aquitaine, Bordeaux (2013); 'Amikejo', [curated by Latitudes], MUSAC, León (2011); 'Stay inside. 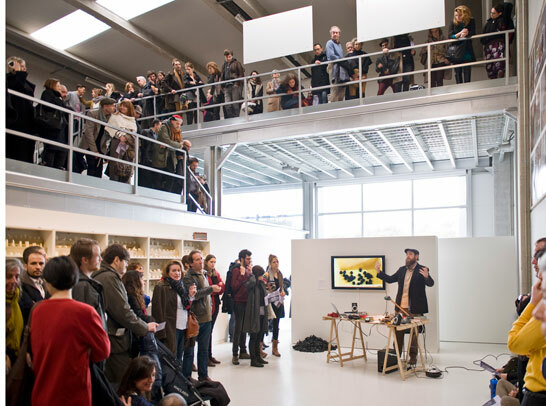 Close windows and doors', produced by consonni, Bilbao, and Casco – Office for Art, Design and Theory, Utrecht; and 'Meanwhile, in the living room...', Centro Cultural Montehermoso, Vitoria-Gasteiz (2007). They have participated in group shows including: 'La Ballena Negra' (The Black Whale), MARCO, Vigo; 'Stem Terug (Vote Back)', De Appel arts centre, Amsterdam (2012); 'Mutual Matters', Konsthall C, Stockholm (2011); 'The People United Will Never Be Defeated', TENT, Rotterdam (2010); 'Gure Artea 2008', Sala Rekalde, Bilbao; and 'Wij waren in Overvecht / We were in Overvecht', Centraal Museum, Utrecht (2008). 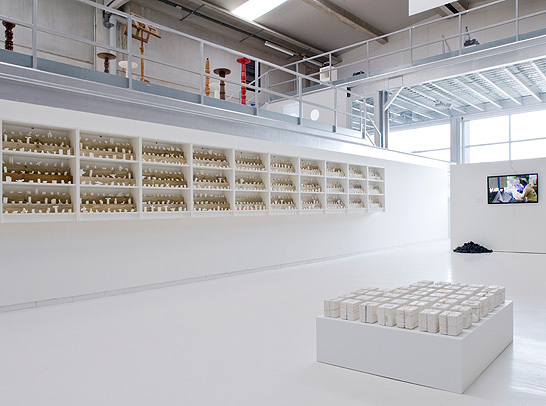 'Producing time in between other things' was produced as part of the Latitudes-curated 'Amikejo' exhibition season at MUSAC, León, in 2011 with the support of the Mondriaan Foundation (currently Mondriaan Fonds). 'Work in Progress' was produced with support from the Eremuak program of the Basque Government and from the Centrum Beeldende Kunst Rotterdam. La exposición 'Los márgenes de la fábrica' presentó dos proyectos recientes realizados por Iratxe Jaio & Klaas van Gorkum, residentes en Róterdam, motivados por su interés en la relación entre el arte y el trabajo. Ambos proyectos exploraron lo escultórico y los procesos de fabricación desde la perspectiva de artistas que, por lo general, no producen objetos. La práctica artística de Jaio y van Gorkum acomete lo que en parte son investigaciones sociológicas, documentando los efectos locales y marginales del desplazamiento de las industrias manufactureras en las dos últimas generaciones, en el contexto del surgimiento del mercado global. Relacionados con la historia personal de los artistas e incluyendo los efectos directos de su propia vocación, así como el trabajo que solicitan a terceras personas, los proyectos son además cómplices de generar preguntas sobre qué tipo de valor aporta la laboriosidad y qué vida política pueden tener los objetos. La inauguración de la exposición contó con la interpretación musical del Británico “avant-folk” Nathaniel Robin Mann, desarrollada en colaboración con Jaio y van Gorkum a partir de las imágenes en bruto del vídeo 'Work in Progress' e inspirada en el tradición de las canciones de trabajo. Mann interpretó la canción popular vasca “Oi Peio Peio”: el diálogo entre una hilandera y su cruel jefe, que insiste en que siga trabajando toda la noche. Recogida originalmente en el Cancionero Popular Vasco en 1918, la canción fue popularizada por el cantautor Mikel Laboa, fundador de “Ez Dok Amairu” (“No Hay Trece”), el movimiento cultural de poetas, músicos y artistas vascos, y cuyo nombre fue sugerido por el escultor Jorge Oteiza. Ver Vídeo. 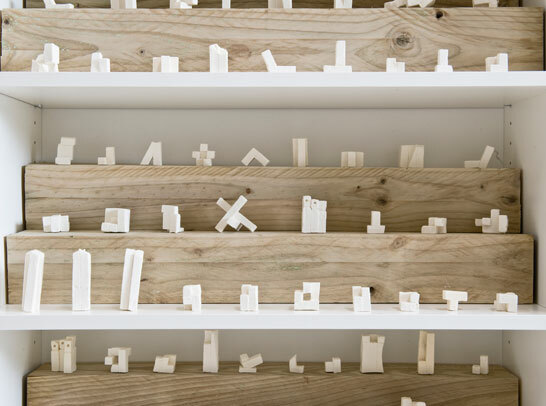 Una selección de objetos de madera producidos por el ya jubilado obrero industrial Jos van Gorkum – el abuelo de van Gorkum – es central en el proyecto 'Produciendo tiempo entre otras cosas' (2011). Los artistas documentaron cada uno de los objetos en los hogares de parientes, amigos y antiguos vecinos a lo largo y ancho de los Países Bajos. Durante este proceso, encontraron el torno original con el que se habían elaborado las piezas y empezaron a aprender a manejarlo. Los elementos que produjeron durante el aprendizaje de este hobby sirven durante la exposición como soporte de los objetos originales, y se muestran junto con tres vídeos y fotografías. 'Work in Progress' (2013) se sumerge en la industria manufacturera en Markina-Xemein, el municipio vasco donde Jaio nació. El vídeo sigue la producción en serie de piezas de goma desde el interior de una fábrica cooperativa hasta los talleres subcontratados donde se acaban las piezas a mano. Los artistas emplearon a las trabajadoras de estos talleres para que produjesen cientos de réplicas de pequeñas esculturas modernistas. Éstas se exhiben finalmente en estanterías prefabricadas evocando el "Laboratorio de Tizas" del escultor vasco Jorge Oteiza, feroz crítico de la mercantilización del arte. 14.15h: Performance vocal e instrumental de Nathaniel Robin Mann, como parte de la exposición 'Los márgenes de la fábrica'. Iratxe Jaio (1976, Markina-Xemein) & Klaas van Gorkum (1975, Delft, Países Bajos) viven en Rotterdam, Países Bajos y trabajan juntos desde el 2001. Ambos estudiaron Bellas Artes en la Royal Academy of Fine Arts, The Hague. Entre sus exposiciones individuales destacan: 'Réinventer le monde (autour de l'usine)', FRAC Aquitaine, Bordeaux (2013); 'Amikejo', [comisariado por Latitudes], MUSAC, León (2011); 'Quédense dentro y cierren las ventanas', producido por consonni, Bilbao, y Casco – Office for Art, Design and Theory, Utrecht; y 'Meanwhile, in the living room...', Centro Cultural Montehermoso, Vitoria-Gasteiz (2007). Han participado en las siguientes colectivas: 'La Ballena Negra' (The Black Whale), MARCO, Vigo; 'Stem Terug (Vote Back)', De Appel arts centre, Amsterdam (2012); 'Mutual Matters', Konsthall C, Stockholm (2011); 'The People United Will Never Be Defeated', TENT, Rotterdam (2010); 'Gure Artea 2008', Sala Rekalde, Bilbao; y 'Wij waren in Overvecht / We were in Overvecht', Centraal Museum, Utrecht (2008). 'Produciendo tiempo entre otras cosas' fue realizada como parte de la temporada de exposiciones Amikejo (2011) comisariada por Latitudes en el Museo de Arte Contemporáneo de Castilla y León (MUSAC) en 2011, con el apoyo de la Mondriaan Foundation (actual Mondriaan Fonds). 'Work in Progress' fue producida con el apoyo del programa Eremuak del Gobierno Vasco y del Centrum Beeldende Kunst Rotterdam.